While you may not know, April is Alcohol Awareness Month. This is a tradition that started as a way to increase awareness about a disease many Americans suffer from. The idea is to spread information locally, statewide, and overall nationwide. Alcohol has touched almost all of our lives in one way or another. The general goal of this month is to create some sort of catalyst for change and awareness. This year’s theme is “Connecting the Dots: Opportunity for Recovery.” This year’s efforts are being directed towards young individuals. These are the people that can be easily influenced by alcohol and drugs if not informed. As a parent the best thing you can do for your child is interfere. While you may want to let your kids grow and learn on their own, it is your job to actively educate them. A whopping 50% of children are less likely to use drugs and alcohol that have conversations with their parents about the risks, than those who do not. Whether we drink, or have been surrounded by those who do drink, alcohol is a huge part of the lives of Americans. At a time in our lives when we are being molded, the use of substances can change our lives forever. The use of alcohol at a young age opens the possibility of developing substance abuse issues later in life. As a parent every effort to help your children “connect the dots” will make a world of difference. A huge part of Alcohol Awareness Month is Alcohol-Free Weekend which takes the first weekend in April. The aim of this weekend is to go 72 hours without drinking a single drop of alcohol. This may seem like a small task to some, but to others it could be almost impossible. That is the reason this weekend is so important. If it allows even one person to come to realization that they can’t go even 72 hours without alcohol, maybe that will inspire them to get some help. 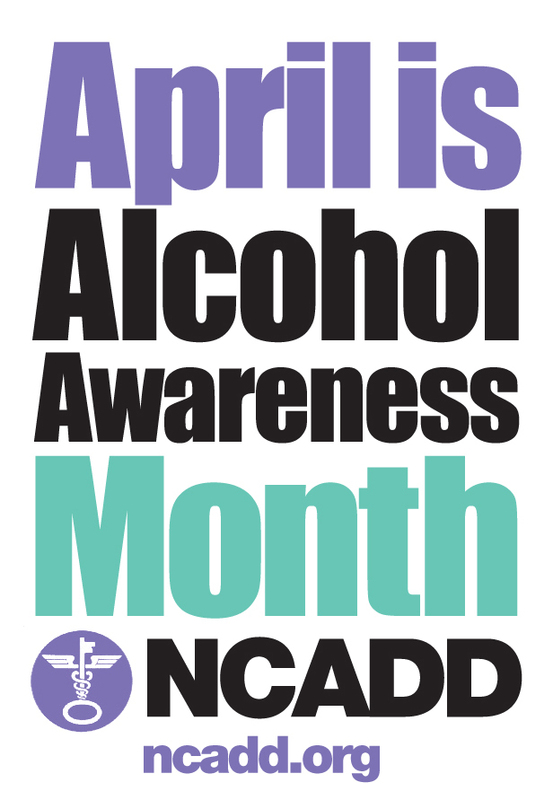 Alcohol awareness month was started in 1987 by the National Council on Alcoholism and Drug Dependence (NCADD). It was started as a way to get the word out and possibly draw attention to those who suffer from alcohol use disorder. Most of us associate this disease as alcoholism. The National Council on Alcoholism and Drug Dependence, originally called the National Committee for Education on Alcoholism, was founded by Marty Mann in 1944. Once an alcoholic herself, she knew that there were many others going through the same struggles she had to, without anyone there to help. There was a stigmatism surrounding alcoholism. It wasn’t looked at as a disease like it is today. She wanted to reach out and share her experiences with others to help aid in their recovery. Mann traveled the country educating individuals on the effects of alcohol. She needed people to understand the consequences drinking had on the body. Though she died before alcohol awareness month was created, she was the inspiration for it. To understand why there is an alcohol awareness month, you must first understand the disease itself. A lot of us have heard of the term alcoholism and assume that this is the only form of alcohol abuse that occurs. Many are not aware that alcohol abuse can come in several different forms. The true term for alcohol abuse is Alcohol Use Disorder. This can still include alcoholism but is not limited to only that. Alcohol Use Disorder is an affliction that can be observed if you use alcohol to the point where it becomes an issue. If you cannot control your urges and continue to use it even though it causes problems, you could be suffering from this. You may also start to notice withdrawal symptoms if you stop drinking and an increase in your tolerance. Binge drinking is another type of Alcohol Use Disorder. This is the consumption of excessive alcohol in a short period of time. For women this means consuming 4 drinks within 2 hours, for men, 5 drinks. This can have long term and short term effects on your health. This is not an obvious form of alcohol abuse, mostly because it can occur as little as once a week. However, this is the most common form of Alcohol Use Disorder. There are many different signs to look for when determining if someone suffers from alcohol use disorder. Some are very apparent while others require you to take notice. If you are experiencing hangovers often accompanied by nausea, shakiness, sweating, and trouble sleeping; these are short term symptoms. Many people try to fight off these symptoms by drinking more. While these may seem like minor consequences, if this becomes a pattern that is sign there may be a problem. If you try to stop drinking and are unable to because you constantly crave alcohol this is a clear sign it is time to ask for help. Drinking can cause a lot of conflict in your life aside from your health. If you start missing out on daily activities like work or outside interests due to hangovers than your life is being affected by drinking. Keep an eye out for family and friends. They may not consciously realize what they are doing. When drinking creates problems with friends or family it is a clear sign that you may have an addiction. Ask yourself how is my drinking affecting myself and those I care about? Alcoholics Anonymous- The first and most common would be AA or Alcoholics Anonymous. The reason this group has gained so much popularity is because it is run by a community of recovering alcoholics. They too have been where you are now and will understand better than anyone what you need to her. They have free meetings in almost every city or town around the country. Their 12 step process will give you an optimistic, driven path to follow on the road to recovery. National Institute on Alcohol Abuse and Alcoholism (NIAAA)- This is an organization that publishes material to help you stay informed. They stay up to date with alcohol and treatment research so that you always have a place to find the answers. If you have questions about the effects of alcohol and other consequences this is the organization to reach out to. National Institue on Drug Abuse (NIDA)- If you have questions about the science behind alcohol abuse, this is the organization to check out. They release data that shows the long term and short term effects of alcohol use. They also may help lead you to a correct diagnosis; if you are unsure of how severe the problem is that you or someone you care about is struggling with. Al-Anon and Alateen- There are a lot of resources available to those on the path to recovery. However, they are not the only ones that need help. If you know someone struggling with this disease you may not know how to help them or deal with the stress that accompanies supporting someone through this tough time. This is group you can reach out to in person or over the phone when things seem to be getting too hard. They will show you how to be both encouraging and understanding. While these are only a few of the groups that you can reach out to, there are many more ready and willing to help. Check your area to find groups that are specific to your local and may be able to help. Once you are ready to address the problem, seeking out treatment is a good next step. Since this is already a hard step to take; you do not want to have to worry about how costly it can be too. Private rehab centers can be very expensive. But they are not the only choice. There are a lot of options that don’t put a drain on your finances. Two less expensive avenues you can take are government funded treatment and non-profit treatment. While the two rely on very different funding support, both can help assist you in a less costly matter. If you are not ready to take that extreme of a step, there are countless helplines that you can call. Just having the opportunity to talk to someone anonymously can make a difference. What can on month do for the lives of so many alcoholics? The important of awareness is more critical now than ever. A 2014 study from the CDC revealed that excessive alcohol consumption was responsible for the death of almost 1 in 10 U.S. adults between the ages of 20 and 64. This means that approximately 88,000 lives are a lost to excessive alcohol use every year. What this accounts for is roughly 2.5 million years of potential life lost every year. These are a result of a combination of long term and short term effects. This is why it is so important to raise awareness on a local, state, and national scale. There are about 20 million individuals and their family members who are living in recovery. This proves that anything is possible. While a month is not enough time to educate and help everyone recover, it at least gets the public talking. Do what you can in your community. Create pamphlets, or newsletters and distribute them around your neighborhood town. Host an event and invite everyone around the community to learn and spread alcohol awareness. Host a fundraiser to donate money to a local non-profit treatment facility. The most important thing we can do as a society is to recognize that there is a problem. With that realization only then can we move forward. There are many people still in the dark about this disease. There are those who struggle with the disease or some who may know, but not recognize someone who is suffering. Maybe this month is an opportunity for us to fix that.